The most effective way for your child to get fluoride’s protection is by drinking water containing the right amount of the mineral… about one part fluoride per million parts water. This is of special benefit to children, because fluoride is incorporated into enamel as teeth form. Children who, from birth, drink water containing fluoride have up to 40% fewer cavities. Many of them remain cavity-free through their teens. Fluoride is one of the most effective elements for preventing tooth decay. This mineral combines with tooth enamel to strengthen it against decay. Fluoride may also actually reverse microscopic cavities by enhancing the process by which minerals, including calcium, are incorporated into the teeth. Even though your regular water supply may be fluoridated, it is still important to discuss with your dentist any additional fluoride needs your child may have. Look for fluoride toothpastes and over-the-counter fluoride mouth rinses that carry the ADA seal. They have been proven safe and effective for their intended use. The advertising claims for these products have been reviewed by the ADA so the claims are accurate and not misleading. - Drinking fluoridated water at school. - Taking prescribed fluoride tablets or drops. - Brushing with a pea-sized amount of fluoride toothpaste after age two. 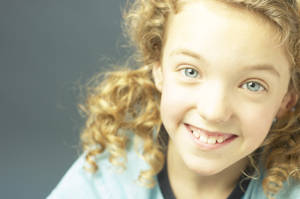 - Using a fluoride mouth rinse for children over age six. People usually think of a newborn baby as having no teeth. But the 20 primary teeth that will erupt in the next two and a half years are already present at birth in the baby’s jawbones. At birth, the crowns of the primary teeth are almost complete and the chewing surfaces of the permanent molars have begun to form. 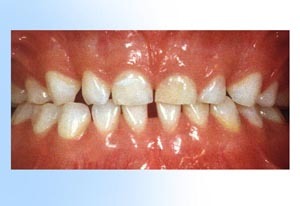 The front four teeth usually erupt first, beginning as early as six months after birth. Your infant depends totally on you for dental care. You should begin cleaning the baby’s mouth during the first few days after birth. After every feeding, wipe the baby’s gums and teeth with a damp washcloth or gauze pad to remove plaque. This establishes, at an early age, the importance of dental hygiene and the feeling of having clean teeth and gums. To clean your child’s teeth, place the child in a comfortable position that will allow easy access to his or her mouth. Remember: Your infant depends totally on you for dental care! Take you child to see the dentist by his or her first birthday. Your child’s first visit to the dentist can be a pleasant adventure. Talk about the visit in a positive matter-of-fact way, as you would any important new experience. Explain that the dentist is a friendly doctor who will help the child stay healthy. During the first visit, the child’s mouth will be examined for tooth decay and other problems. The teeth may be cleaned by the dentist or dental hygienist. The dentist will explain how the child’s teeth should be cleaned at home, how diet and eating habits affect dental health and methods to ensure that your child gets sufficient fluoride. Most children have a full set of 20 primary teeth by the time they are three years old. Primary teeth are just as important as permanent teeth, for chewing, speaking, and appearance. In addition, the primary teeth hold the space in the jaws for the permanent teeth. You should start brushing the child’s teeth as soon as the first tooth erupts. Flossing should begin when all the primary teeth have erupted, usually by age 2 to 2 ½. 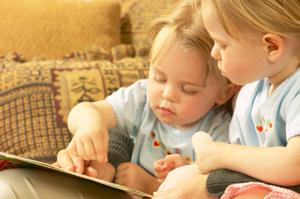 By age 4 or 5, the child may be able to brush his or her own teeth under supervision. The pre-school years are an important time to help your child establish good eating habits, since you can control your child’s diet successfully. At this age, many children need to eat snacks or “mini-meals”. They cannot always eat enough food at mealtimes to get all the nutrients and energy they need. 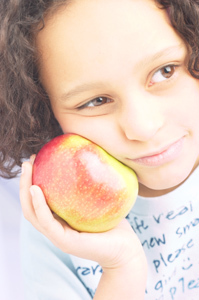 Help your child choose sensible snacks  foods that don’t promote tooth decay. To prevent tooth decay and periodontal diseases, tooth brushing and flossing are needed daily to remove harmful plaque from your child’s teeth. Look for a toothbrush that bears the ADA seal. They have been shown to be safe and effective for their intended use. The advertising claims for these products have been reviewed by the American Dental Association and the claims are accurate and not misleading. Ask your dentist to recommend a toothbrush for your child. Children need smaller brushes, specially designed for them. Generally, a brush with soft, end-rounded or polished bristles is recommended, since it is less likely to injure gum tissue. Check your child’s toothbrush often and replace it when it is worn out. Bent or frayed bristles will not clean plaque from your child’s teeth and they can damage gums. The ADA recommends replacing toothbrushes every 3 months. Brushing removes plaque from the inner, outer, and chewing surfaces or the teeth. Select a fluoride toothpaste with the seal of the ADA. Children under six years of age should clean their teeth with a pea-sized amount of fluoride toothpaste after every meal and at bedtime. 1. Holding the toothbrush bristles at a 45-degree angle against the gum line, move the brush back and forth with short strokes - half a tooth wide - in a gentle, scrubbing motion. 2. Brush the outer surfaces of all teeth in the upper and lower jaws. Repeat the same method on the inside surfaces and chewing surfaces of all the teeth. 3. Finish by brushing the tongue to help freshen breath and remove bacteria. 4. Use about 18 inches of floss, wind most of it around the middle fingers of both hands. Hold the floss tightly between the thumbs and forefingers. Use a gentle, sawing motion to guide the floss between the teeth. 5. Curve the floss into a C shape and slide it into the space between the gum and the tooth until you feel resistance. Now, gently scrape the floss, in and up and down motion, against the side of the tooth. 6. Repeat this procedure on each tooth. Don’t forget the backs of the last four teeth. Flossing removes plaque that hides between the teeth and under the gum line, areas where a toothbrush cannot reach. Supervising your child while he or she brushes and flosses will ensure that a proper job is done. Plaque is a sticky, colorless film of bacteria by-products that constantly forms on everyone’s teeth. Unless it is thoroughly removed daily, it can lead to dental cavities (tooth decay) and periodontal diseases (gum diseases). Tooth decay is a major cause of tooth loss in children. Tooth decay, or dental caries is caused by bacteria. For a tooth to decay, three elements are needed: plaque, food containing sugars and starches, and a susceptible tooth. When foods containing sugars and starches are eaten, the bacteria in plaque produces acids that can dissolve tooth enamel. The sticky plaque holds these acids onto the teeth, where, if left, the acids can begin to attack the enamel. After repeated attacks, the enamel may break down, forming a cavity. Periodontal diseases afflict the gums and bones that support the teeth. A recent survey stated that some form of periodontal disease affects 39 percent of children and 68 percent of teenagers in the United States alone. Furthermore, periodontal disease has proven to be a worldwide problem with all age groups. Studies show that many periodontal problems, which occur later in life, could be caused by the neglect of oral care during childhood and adolescence. An early sign of periodontal disease is swollen bums that bleed easily, especially when teeth are brushed or flossed. Toxins that are created by bacteria found in plaque cause periodontal diseases. If plaque is not removed by daily brushing and flossing, along with regular professional cleaning by a dentist or dental hygienist, these toxins can irritate the gums, making them tender and likely to bleed. If not treated at an early stage, bleeding gums can become progressively worse. Eventually, affecting the bone, which can cause teeth to become loose or to fall out.